NEW YORK (WABC) -- The holiday season is in full swing, but not everybody wants to cook, eat or shop. Luckily for you, we're here to help. We've got a list of 7 things to do around NYC. It's good for locals, tourists, or anyone just looking to have a good time. Most will be fun for kids of all ages, but there's at least one that's for adults only. The National Geographic Encounter Ocean Odyssey is now open in Times Square. 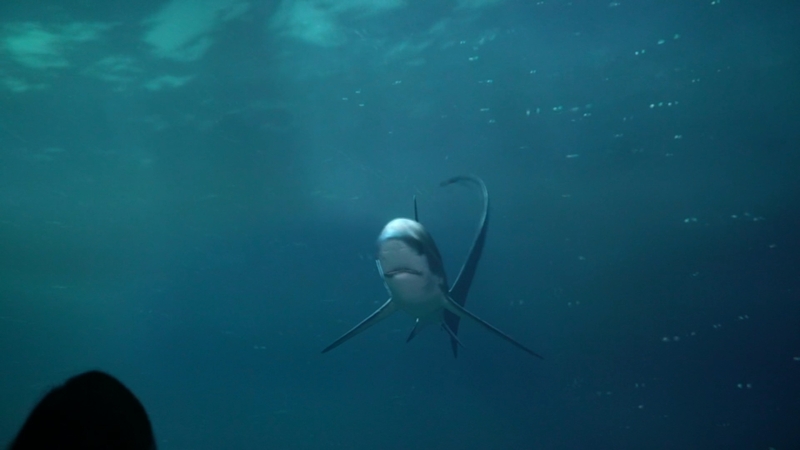 Go on a breathtaking undersea journey and stare down a shark in Times Square? The National Geographic Encounter is located at 226 W 44th St. Ticket prices are $39.50 plus tax for adults, $36.50 plus tax for seniors 65+ and $32.50 plus tax for kids 12 and under. Come face-to-face with sea creatures right from Times Square. A pop-up in SoHo, CandlePower by Yankee Candle is allowing New Yorkers to escape the chaos of city life and the best part? You don't have to spend any money to experience it. Hang out in a wonderland of flowers. Chill out poolside, or spend time in an sideways room often referred to as the upside down-room. It's one of the more popular rooms where you and your friends can climb a wall and appear to defy gravity. Don't be surprised to see photos from the exhibits filling up your Instagram feed. 3.CAN YOU REALLY TRUST YOUR SENSES? A new immersive experience at the American Museum of Natural History has visitors experiencing their senses in a whole new way. "Our Senses: An Immersive Experience," has 11 'funhouse-like galleries' as the museum describes it, looks at how the brain makes sense of the world around us. Tickets for general admission and Our Senses will cost $28 for adults, $22.50 for students/seniors and$16.50 children ages 2-12. Museum admission is free to all New York City school and camp groups. The American Museum of Natural History is located at Central Park West at 79th Street on the Upper West Side. New immersive experience at the American Museum of Natural History. A miniature golf course sits atop a New York City rooftop. Don't be fooled by its amusement park look though because Moxy Hotel's Magic Hour Rooftop Bar & Lounge is certainly not child's play. The putt-putt course is called "Foreplay," which features life-size cartoon animal sculptures in suggestive poses. Moxy Hotel's Magic Hour Rooftop & Bar is located at 485 7th Ave. (at 36th St.) in Times Square. Magic Hour Rooftop Bar & Lounge sits atop Moxy Hotel in Times Square. "Downton Abbey: The Exhibition" is a fully immersive experience that puts fans right inside the great halls of the hit show. From complete sets to props, costumes and special videos created just for the exhibit, you will be transported to the post-Edwardian Era that was so beautifully displayed during the show's six seasons. But you don't have to be a fan to appreciate the exhibit. The exhibition offers lessons in British historical events, fashion and society. "Downtown Abbey: The Exhibition" is located at 218 West 57th Street between Broadway and 7th Avenue. Experience Downton Abbey like never before! "Never Built New York" invites visitors to take a look at different prints, models, animations and installations featuring Manhattan as you have never seen it before. Admission to the Queens Museum at the New York City Building is a suggested fee of $8 for adults, $4 for seniors and free for students and children under 18. See New York City in a whole new way. The Bronx Zoo unveils a new Treetop Adventure. Go flying down a 400 foot zip line across the Bronx River. The two hour climb is $64.95. See what it's like to zipline across the Bronx River.